I thought I would give you a little insight today on some things I believe about the Bible vs. the Word of God. Notice I said that as though those were two different things. I believe they are, and if you read on, you will soon see why. I would like to share where I am coming from with regards to how I believe Scriptures ought to be viewed. Some people hold the belief that God was in full control when the Bible was written and compiled. My view is that Love does not control. God is love. The very nature of love is that it never controls another. Control is something the enemy seeks to do to people so that they no longer have any power to decide for themselves - so that he can manipulate and use people, like a puppet on a string. This is not something our God of love would ever seek to do to another human being! That is not the nature of Love. God is Love and His nature is such that He DESIRES that we be in sweet fellowship with Him. And within the context of that loving relationship, He DESIRES that we listen to Him and do what He says because everything He says and does causes light, life, peace, joy and love to flourish. He is love and He would never ask us to do something apart from His love. And so we have the magnificent gift of choice always to allow Him to flow in and through us. We can choose to lay down our own desires to do what pleases the flesh, and decide to do what pleases Him. It is a choice we make though, every second, every moment of the day. It is not like Holy Spirit enters a man and from then on, that man has no choice but to do good and to love as God loves. That would be impossible, for as soon as you remove the choice to love, there is no love. Because love is always a free choice. And God ALWAYS leaves us with that choice. No one can say that God ever seeks to control another. He only asks that we obey and work WITH Him to accomplish His will on the earth. We get to work WITH, IN and THROUGH Him (what a concept!!) just as He can work with, in and through us. This is a love relationship, not a control dynamic. Just as with any of us who have Holy Spirit indwelling, He is only flowing through us as much as we allow Him to in any given situation. Each moment, with each breath we take and with each and every thing we face, whether it is a cranky complaining child to deal with, or a grocery list to fill at a store, we have a choice. We may allow and let Holy Spirit thoughts reign supreme in our minds, and be led by Holy Spirit motivation, and take Holy Spirit inspired action. Or, we can choose in each of those moments, to think, be motivated by, and to do what pleases our flesh. The choice is always ours. Assuming you are a reader who loves God and wants to live to please Him only, do you think that you have ever lived out a 24 hr period where you were entirely and perfectly led by the Spirit of God, lovingly being filled with His thoughts, His motivations, and doing the work of His hands and feet - I mean for the entire day, not one moment excepted, fully and entirely submitted to God for that 24 hr period? With not one moment of lapsing into the flesh? Lets say the answer is no, because I would assume such for myself as well. But lets just say you had a conversation with someone. And you knew, just knew somehow within you, that Holy Spirit was pouring love thoughts of Truth into your mind and the words you were speaking were coming out in a flow of love. And that you were motivated by Love and Truth. Perhaps you even surprised yourself at what you heard yourself say. Would you honestly be able to say, beyond a shadow of any doubt, that God was FULLY and COMPLETELY in control of your ENTIRE conversation with that person? Did you ever feel at any time, that you had no choice over the words that came out of your mouth? Or would you admit that you always had the choice to speak, or not to speak - always had control of your own tongue? And would you also admit that although you felt very led and very inspired, and that you knew Truth was coming out of you, that perhaps there was a bit of flesh mixed in now and then, just because you are an imperfect vessel, still learning and growing in God? I think if we are honest, we would have to admit that there are no solid days of complete and total submission and flowing in God's Spirit for any of us just yet. Neither are there conversations that don't have a little of "us" mixed into them, no matter how inspiring they may be. In order to think that the Bible is the infallible word of God, and was fully controlled by Him as it was written, you would have to believe first of all that "control" is love. Because God is love, and if He controls people, then that must be what love is and does. That totally taking over a person's pen as they write, and not giving them ANY allowance to make mistakes would be love in action. In order for that to happen you would have to believe that God did in fact totally control another person, even for a set time as they wrote the book, not giving them any choice at all over what words were written down. Secondly, you would have to believe that there WERE people, many people, as many people as there are Bible book authors, who WERE Holy Spirit controlled while they were writing those books and letters. Do you see what I am alluding to? If WE aren't infallible in our writings and speakings and doings, we who have Holy Spirit LIVING on the inside of us, then why should we think that there are "special people", exceptions to the rule, who COULD write and speak infallibly, controlled fully and completely by Holy Spirit? Everything that has come to us through man has been tainted with man's flesh. There is nothing man has done, ever, apart from The Man Jesus, that did not have some flaw, some mistake, some weakness, some error mixed in. If God controlled the people who were putting pen to paper, writing the books of the Bible, then He went against His very nature to do so. Even if He did control people while they wrote the words, and they took perfect "dictation" from God, then why is it that the writing style is different for each author? Where did those subtle literary differences come from? Wouldn't the writing style be consistent throughout, as coming from One Author? How could man's personality and writing style be included in the Bible (which it is) if God was controlling their pen? If Jesus had written the Bible, then it would be infallible. Jesus did not write the Bible. People wrote it, under His influence, under His guidance, and under His inspiration. Just as WE ourselves will write, speak and do things under the same unction. Yet knowing that there will be flaws, when we do speak, write and do things in His name, that is what keeps us seeking and searching for HIM. With a perfect Bible, one would never need to seek the Perfect God who wrote it. One could say he knew it all, just by reading and believing the infallible written word of God. One could get very lulled into thinking they were "right" or "righteous" because they read it, believed it and followed it. Isn't that exactly what the Pharisees were doing whom Jesus called "white-washed tombs"? But God asked imperfect people with flaws to write the Bible. And in doing so, He has allowed the flaws. Why? So that we would seek HIM. So that we would seek the One Who inspired the book, so that we would get to know HIM and not just His words to us. If you say the Bible is infallible, you have separated God's Word from the Godhead. You have in essence, said that what He said and who He is are two different things. But the Word of God became flesh and dwelt among us. His name is Jesus. He is not separate from God, He is God. You can trust the Word of God who is Jesus, and by doing so, trust God. Or you can trust the written word, which are just words on a page. But you can't trust both. Its either one or the other. Those who believe the Bible is infallible have added another God to the Trinity. For now there is God the Father, God the Son, God the Holy Spirit, and God the written word. We are to "test every spirit, to see if it comes from God"
We are to "rightly divide the word". What are we to divide it from? To divide it between what words are God's, and what words are man's. And we are not to use our own mind to decide where man's messages are mingled with God's as we read the Bible. The Holy Spirit is the one Who brings us illumination on these things, so that we can rightly divide the word. It is within the context of relationship with God that we find the Truth. Not apart from it. We have the ability to hear Him on these matters, because His sheep know His voice. And another's they will not follow. He illumines, through His very character, which is love. And as we get bigger and bigger revelations of His great love, we see the written word of the Bible more clearly and come to understand what passages mean and what He is trying to say in and through them. Through His relationship with us, we get excited over hearing Him speak THROUGH the scriptures, as we get closer and closer to Him. Some may argue that Satan would love for us to believe that the Bible is not holy. But I say, Satan would love for us to believe the Bible IS holy and infallible. Because then we have no need of Holy Spirit to illuminate what He is trying to say to us. We can therefore falsely assume that we have no need of relationship with God as we are reading it, and no need to divide the word between the word of man and the word of God. Whats worse, we get a picture of God as wrathful, vengeful, violent, angry and as someone to live in dreaded fear over displeasing. Because if you are honest, the entire Old Testament and the book of Revelation, believed as written, paints this view of God. Worse yet, we then have cause to be prideful - for if we believe the Bible is God's infallible word, then all we need to do is follow it to feel good about ourselves. All we need to do is everything it says and then we have ticked off the list of "must do's to please God" and we can feel awfully self-righteous about that. God's Word is a Person, and His name is Jesus. God is not printed words on a page. The Word of God IS Holy and infallible, because The Word of God IS God. The Word of God is Jesus. He is our only True face of God and He alone can lead us to see what written words came from Him and what words came from man. Without Him, we can do nothing. We cannot understand the Bible, cannot grasp its' meaning, cannot know God. When we have Him guiding us, we begin to see the words that are written that contradict His character. We see how the flaws of man have been mixed with words of truth into the written word. And He shows us what we are to cast off like chaff in the wind, and what He wants us to keep and digest - the hearty grains of Truth that become our Daily Bread. The Bread of Life who is Jesus. Satan WANTS us to completely trust the written scriptures, for in that, there is no room to trust the LIVING GOD who IS The Word of God, who is Jesus. I believe Satan wants us to doubtfully question God's Word (not the written word, but the Holy Living Word) - in other words, to question Jesus - and to question His Stellar Character. I believe God wants us to read the Bible with the understanding that it has flaws, just as each of us do. And with that in mind, to turn to Him for help as we read. We are to let our reading of scripture be a time of sweet fellowship with Him. We have the privilege of reading the scriptures and to picture Him reading over our shoulders, pointing to this and that, whispering His Truth to our hearts, helping us rightly divide the word. The written word is a wonderful gift to mankind. It is a pathway TO The Word of God. It brings us TO Jesus. But it is not on equal par with God. You and I are a wonderful gift to mankind. We also are pathways for others to find God! We also bring people TO Jesus! But also, we are not God, we have flaws too. We are living epistles. Imperfect as we are, yet we carry the Living Word of God to people. So too is the Bible -- imperfect, as it was written by imperfect man, yet it too carries the Word of God to people. I love to read the written word, the Bible. But I want to listen as I read. I listen for the voice of the Holy Spirit because I know I need Him to discern what I am reading. I want to find the Living Word as I read the written word. For He is all that I seek and long for. He is Love and He is Good. And He always has something life-giving and encouraging and kind to say to me. He can't help it, for He is love. :-) He is a rewarder of those who diligently seek Him! And He is our reward! How wonderful to receive Him - to be embraced by Love Himself. He never ceases to amaze me! Thanks for coming by Precious People! God bless! I have a winner from last week's blog hop! 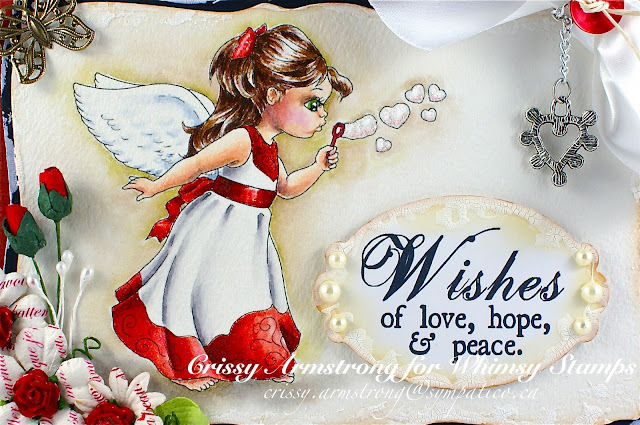 Rhonda Miller was chosen by Random.org and she receives "Come Fly With Me" rubber stamp from Whimsy Stamps! Rhonda was number nine on the list of people who signed up for the draw using the Inlinkz option on my last post. Congratulations Rhonda, contact me and I'll get Denise to send you your blog candy! New Rubber at Whimsy! Blog Hop is on! 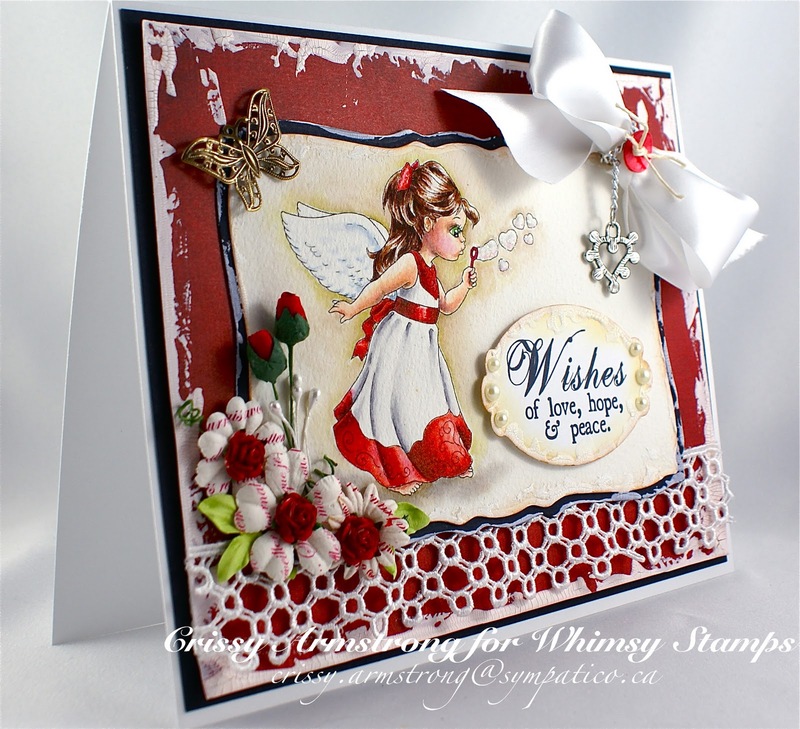 You have arrived in the middle of another blog hop for Whimsy Stamps! If you have landed here randomly and would like to do the "hop" with us, then hop on over to the beginning at Annika's blog. 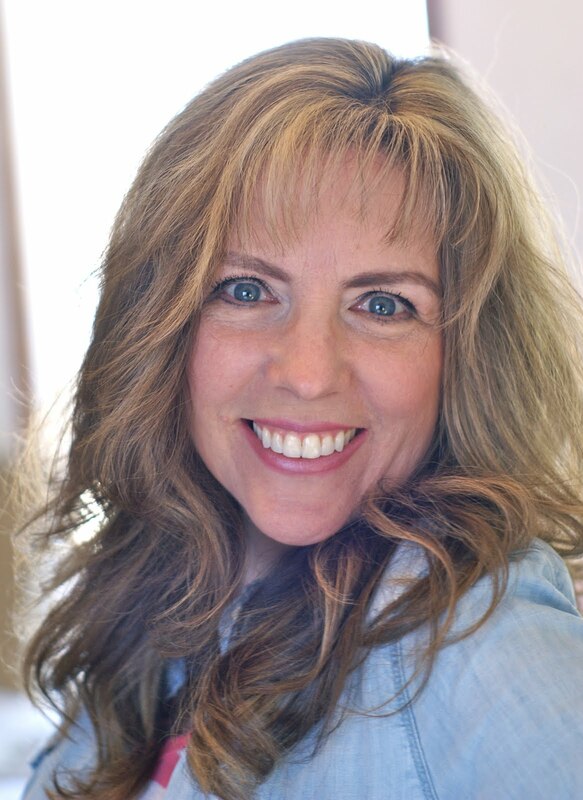 If you have arrived here from Denise's blog, you are right on track! 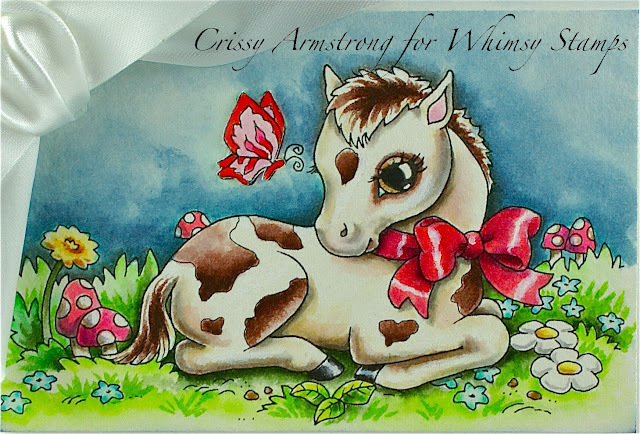 Today Whimsy is releasing 3 stamps by Crissy Armstrong (yours truly) 3 stamps by Meljen's Designs, 4 stamps by KennyK, 2 new sets and 1 new background by Raindrop Echo Designs as well as 2 new dies. 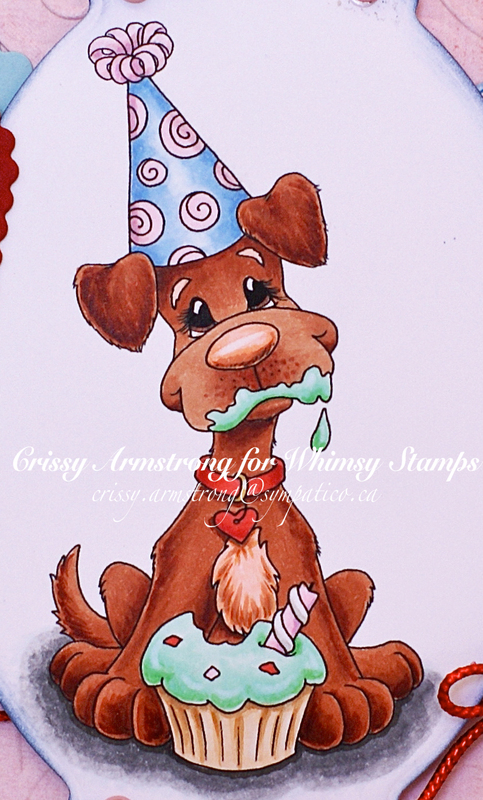 I coloured "Cupcake Bliss" with Copics (sorry, forgot to write them down -- again!). I used Ann's Ticket Die and Ticket Sentiments. Such a cool set, and so easy to use! Spellbinder dies were used to cut out the main image and the hearts. Cuttlebug swirls folder on the pink piece behind the oval. And a Cuttlebug die for the corners, which was 2 squares that I simply cut in half. This was my youngest daughter's birthday card and she loved it! Your next stop is Chris Olsen's blog. I would not miss continuing if I were you! There is so much eye candy along the way, not to mention opportunities for blog candy! And speaking of, don't forget to add your name to the Inlinkz option below. You don't even have to have a blog to join! Just click on the blue button and you'll be directed from there. Thanks for coming by today! Be blessed! 2nd Special Hop, plus last week's Winners Announced! If you do choose to add this button to your sidebar, you get another chance to win some or all of the special images that are being sold for this purpose. 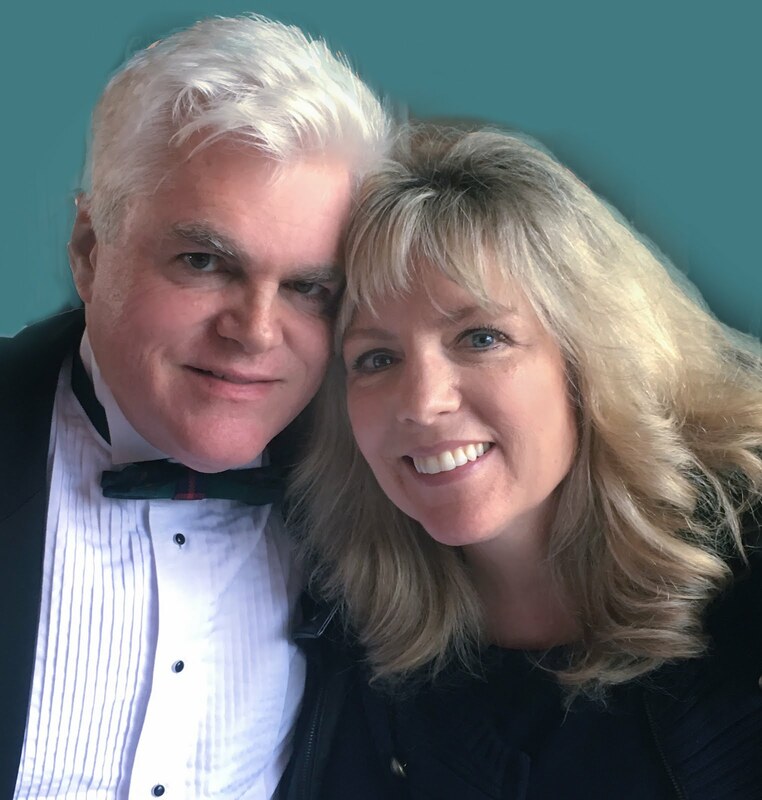 Be sure to check out Ann's blog for all the details. Congratulations to Marie-Ann, you were number 2 from the Inlinkz list on my blog so you have won the grand prize, which consists of all the images in the set, as well as a ten dollar gift certificate to the Whimsy store! Note to all the winners: Please contact me so we can get your contact information and get your prizes to you! Hello and welcome to a very special blog hop today! The illustrators of Whimsy Stamps have come together to draw a special set of digi images for the purpose of raising money for the relief effort in Japan. All proceeds from the sale of these images will be donated to that cause. Kenny K, Raindrop Echo Designs, Meljens Designs, and Crissy Armstrong all contributed art work. For the whole month of April, you can purchase the images as a set or individually (your choice) by visiting this page on the Whimsy store site. Please consider helping this special cause by purchasing one or all of the digital images we are offering. This is the first stop on the hop today. I have the blog rotation order posted below if you need to refer to it. The amazing ladies of two design teams have come together to host this blog hop for you! Crissy's Crew from Sundays With Crissy and Denise's DT from Whimsy Stamps have joined forces to design some amazing jaw dropping creations for you. You have seven days to hop through all the blogs and enjoy all the lovely creations from these talented people. The hop runs from now through til Sunday April 10 at noon. There will be several opportunities to get some blog candy! Four random commenters will get a chance to receive one of the three individual images or Ann's sentiment set. So be sure to leave comments all along the way for your chance at a free digi! 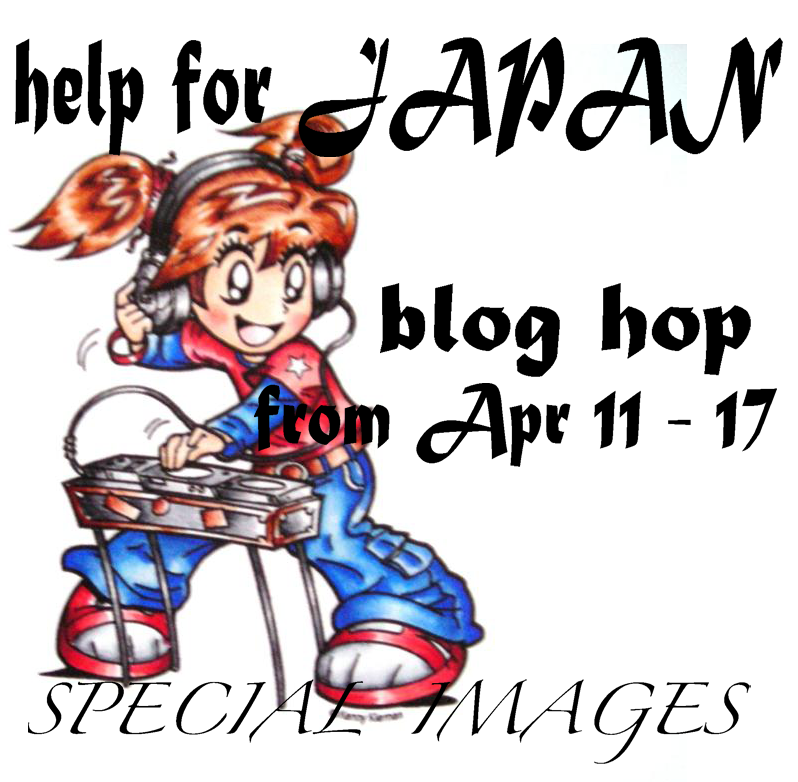 Also, if you post the "Help for Japan" button on your blog's sidebar, you can enter into the draw for the grand prize! The grand prize will consist of the entire digital set made just for this cause as well as a gift certificate donated by Ann of Raindrop Echo Designs worth 10$ to use at the Whimsy Stamps store! 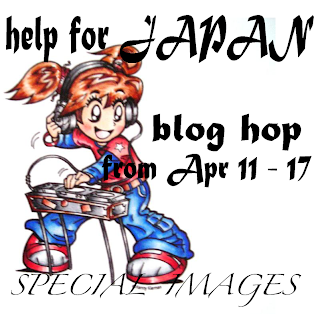 To enter, you must help us advertise for this cause by posting the "Help Japan" button on your blog's side bar (just grab it from my side bar or from the top of this post) and then get your name on the Inlinkz option near the bottom of this post so we can be sure to find the winner. I must tell you that I was totally inspired by a card Claudia of Pretty Pressings posted in February. I found the contrasts just stunning and I wanted to copy a lot of what she did because it really caught my eye. I used my Heartfelt Angel and coloured her with a mix of Tombow Pens, Distress Inks and Twinkling H20's using water colour techniques. My sentiment is from the set that Ann made that is part of these special digi images. I wanted to shorten the saying a bit, so I brought it into Photoshop and cropped the second sentence off. I used white crackle paint along the edges. This curled the paper a bit, so I couldn't tape it down flat. So I worked with it and gave it some dimension by using foam tape. I thought you would see it on the side view but apparently not. The black layer is hiding the shadow I guess. Here is your close-up. The bubbles turned out cool I think. I just used some Glamor Dust glitter on them. But I think the light washes of background colour around them makes them pop (pun intended, lol). Next you'll want to visit Maria's blog to continue hopping. But before you go, make sure you enter your blog (or just your name if you don't have a blog) so you can be entered into the blog candy! Thank you so much for stopping by, and for your support of this very worthy cause. Hello everyone! I am so glad you stopped by today. 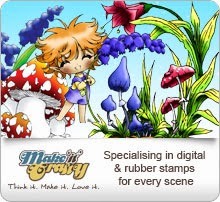 I have some new digi's released at Whimsy Stamps this month and they are available right now. In fact you have landed in the middle of the blog hop for Whimsy! 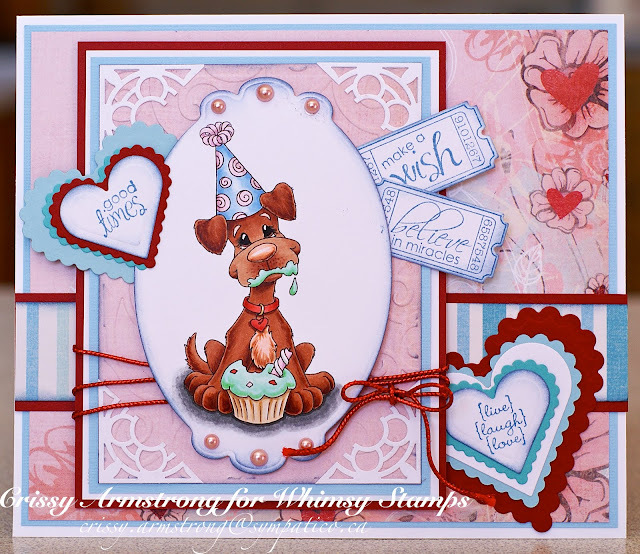 The Whimsy Digi Design Team has some lovely creations to share with you today, so I encourage you to hop from blog to blog taking in all the beauty they have created. Along the way, there is blog candy to be won, so as you hop be sure to leave a comment on everyone's post so that you will have a chance of winning. Two random blogs will be offering a free digi to one lucky winner. 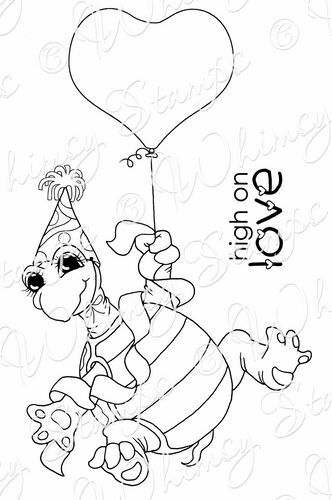 Then on the last stop of the hop, there's a grand prize up for grabs - the winner will get their choice of five digi images from Whimsy Stamps AND a chance to use those images in a guest spot on the Whimsy DT for the entire month of April! You have from now til Friday April 8th at noon to complete the hop and be eligible for blog candy! If you have landed here from Dawn's blog you're right on track. If you wish to start at the beginning of the hop, go to the Whimsy Inspirations Blog, where they have a complete list of the hop links for your convenience. This is "Lilly Filly". She comes separately from the background. And when you buy her, you get two images for the price of one - one with her spots and one without. I thought it would be convenient for those who didn't want the added detail of spots. I put her in the background I created called, "Meadow Background" by merging the two images together in Photoshop. I printed the image onto watercolour paper with a laser printer, heat set, and coloured it with my Tombow Pens which are water based, and spread the ink with water on a paintbrush. I explain this colouring method fully in my Water Colour tutorials which are linked just under my blog banner at the top of this page. One additional thing I did was to paint white highlights using white acrylic paint. I don't normally do that when I water colour, but I had lost some of the white of the paper by overpainting, and so I had to get them back with white paint. It is a method I can use when I make that mistake. For my card, I made the yellowish layer by printing off Ann's digital sentiment from the "New Beginnings" set onto white card from Staples. I then sponged on "Scattered Straw" and "Tea Dye" Distress Inks for some colour, then tore the edges. 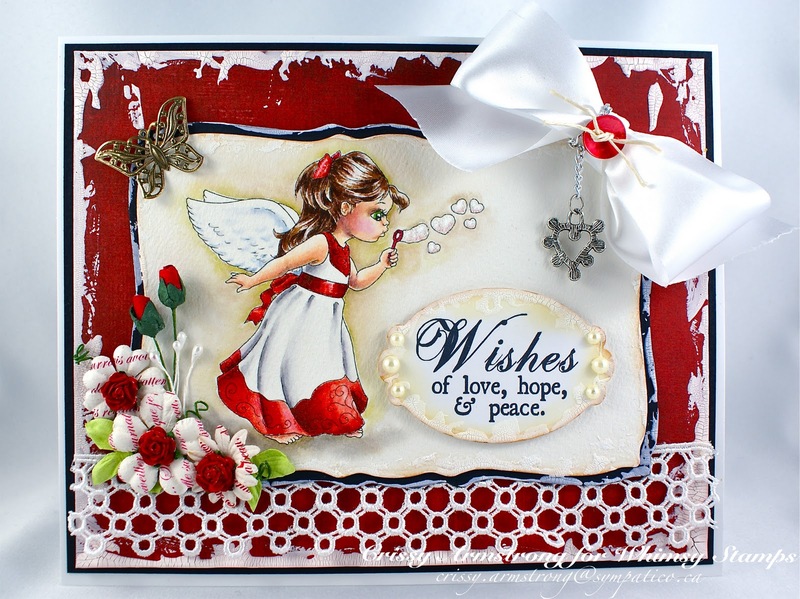 The little white flourish on the right is from the "Fleur de Lis" die by Spellbinders. The darker blue background paper is by Basic Grey. 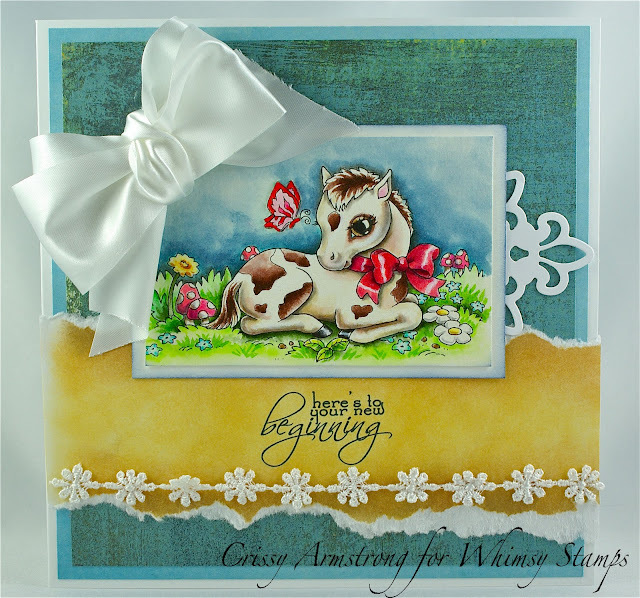 From here, hop along to Debbie's blog to see what she has created for your enjoyment!